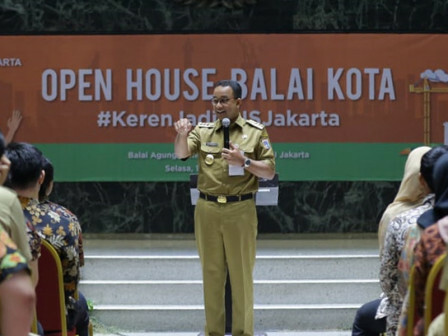 Jakarta Government holds City Hall Open House ahead of Civil Servant Candidates (CPNS) Recruitment 2018 with title #KerenJadiPNSJakarta.
" We encourage the best youths to create positive transformation in all sectors to make Jakarta better"
In that chance, Jakarta Governor, Anies Baswedan reminds participants who want to be PNS for not be motivated due to its status. But they should know about PNS or civil apparatus role. "You should know that PNS is a civil servant who give the best for residents," he mentioned at City Hall, Tuesday (9/18). According to him, Jakarta Government needs the new generations who are creative and innovative. "We encourage the best youths to create positive transformation in all sectors to make Jakarta better," he affirmed. Meanwhile, Acting Jakarta Civil Service Agency (BKD) Head (Plt), Budihastuti added, Jakarta CPNS Recruitment 2018 will be done at the same time with CPNS Recruitment in national scale. Its registration is done via online at sscn.bkn.go.id on September 19. "We want them who are chosen as PNS in Jakarta Government trully has an integrity, competent, able to develop Jakarta, and realize an independent society," he explained. Participants for today's open house has passed the registration stage on September 7-10, 2018. Then, 100 people are selected from total 4,700 registrants both from their academics and non-academics.